CAT BOX by GRAIL GAMES is on KICKSTARTER right now! Trust us your going to want to back this adorable cat puzzle game that is fun for the whole family! This game gets the family laughing and talking. You can choose wither to play nice or play with the vengeance. Grail games will be revamping this game making it available world wide. We have fallen in love with Grail Games over the past year or so. They specialize in fun family games. Most of their games do come in small boxes however they deliver a lot of punch. These games are very thematic which our family loves. Every game is high quality and includes amazing components. You can tell they have high standards and love games themselves. Check out their site at Grail Games. Aza Chen is the amazing artist behind Cat Box. He has been a part of a lot of cutest family games. We have a few of his games. Kitty Paw and Cat Tower. Yes, your sensing a theme. We love Cat games. All of them our family orientated, cute and different! Kitty Paw is a dexterity fast puzzle game. Here is our review of Kitty Paw. Cat Tower is a dexterity stacking game. and Cat Box is a puzzle game. You can find more on his work here. Alright now to the good stuff more about Cat Box! What will you get in the box? Each player will be dealt a secret identity card. Try to keep it a secret so the other players wont try to hurt your game play strategy. The player with the most victory points wins! Using a combo of cats visible matching their secret identity and building connections to earn victory points. Shuffle all the Cat Box Cards (either side is ok) and form a draw pile. *** Remove 2 cards when playing with 5 or 3 players. Remove 3 cards when playing with 4 players. Remove 1 card when playing with 2 players. Each player draws a number of Cat Box Cards from the top of the draw pile. ***Draw 1 card is you are playing with 5 or 4 players. Draw 2 cards when playing with 3 or 2 players. **** Note when drawing cards from draw pile keep the topside (public) visible towards other players. The bottom side is a secret for the player who draws the card. When you play your card it will always be from the side you are looking at i.e if you steal a card you will play from the (public) side you see before stealing. When you play your own card you will play the (secret) side you are viewing from your hand. Turn over the topmost Cat Box card from the draw pile and place it in the center of the table. You have 2 action options per turn. 1. 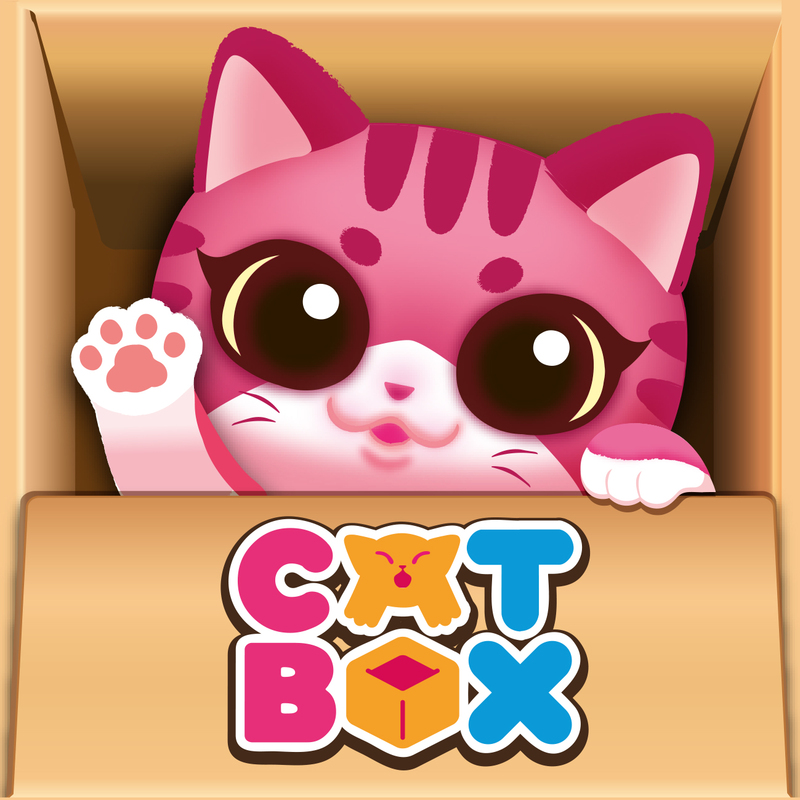 Play at Cat Box Card from your own hand. You must play the secret side faceup. 2. Play a Cat Box Card from another player’s hand. Must play the Public side faceup. When playing a Cat Box Card you must follow these rules. The cards MUST all face the same direction. The Cat Box Cards played MUST cover an existing card in the play area over 1 or 2 squares of the existing card. If the Cat Box Card played has all cats you may only cover 1 square of an existing card. If the Cat Box Card played shows an empty box on one of the squares. You MAY cover 1 or 2 squares on an existing card. Refill hand cards to end turn. The player whose Cat Box Card was player this turn refills their hand to the initial limit. Respect the Public/Secret rule. The games ends when all players have no Cat Box Cards in hand. Players reveal their cat identities and count their score. Each visible cat that matches your color is worth 1 victory point. Find your largest connection of cats (Cats must be next to each other) and add the total number of cats in your connection to your total of cats. The person with the most victory points win!!! During a players turn you now have an additions action. You may choose to play at most 1 of your Cat Box Tokens. Remove the token from the game upon using it. Each unused Cat Box Token is worth 1 Victory Point (VP) in the end of the game.